A statue of an angel holding a mobile phone was unveiled earlier this month at St John’s Cathedral in the Dutch city of Hertogenbosch. The angel is the brainchild of sculptor Ton Mooy, who was commisoned to make a total of 25 new angels statues for the cathedral. The last in the series needed a modern twist, he decided. 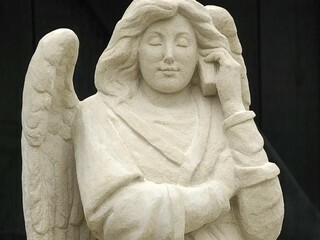 As well as holding a mobile phone, the carved stone angel is also wearing jeans! The phone has just one button, the artist says – it directly dials God.